Wild animals, steep roller coasters or mysterious labyrinths? Tell us what you like, and we will take you there! This is a real cycling holiday among the most enjoyable amusement parks of Italy, located at a short bike ride from Lake Garda, with its beaches and health spas. Enjoy your first day on bike among Lugana vineyards, the typical white wine of this area. You'll reach Solferino, the site of the famous battle that in 1859 ended the Italian Second War of Independence, providing the basis for a united Italy. We will then go back to Peschiera by bike. Leaving Peschiera, today we head for the Sigurtà Garden Park (www.sigurta.it), skirting the River Mincio along the famous cycleway that leads to Mantua. Our first port of call is the riverside hamlet of Borghetto, listed among "Italy’s most beautiful villages" and renowned, along with neighbouring Valeggio, for its tortellini. Sigurtà covers a surface area of 600,000 sq. meters, with paths linking 18 ponds, meadows, a labyrinthine maze, a medicinal plants garden and large sundial, as well as an educational play farm. Today's menu is for kids only (of all ages! ): Gardaland one of Europe's top theme parks, offers dozens of rides and attractions. The park can be reached by free shuttle service from Peschiera station, or if you are feeling energetic ride your bicycles !! Alternatively you can also enjoy the Sealife Aquarium or the Canevaworld Aquapark! Today’s menu is strictly for kids only (of all ages! ): Gardaland (www.gardaland.it), one of Europe’s top theme parks, offering dozens of rides and attractions. The park can be reached by free shuttle service from Peschiera station. Alternatively, why not enjoy the Sealife Aquarium or the Canevaworld Aquapark (also served by free shuttle). Today you'll cycle among hills and hamlets surrounding the lake, thanks to a short ferry transfer to Garda, the small town which gave its name to the lake. Once in Garda, you'll start cycling towards Bardolino, famous for red wine! From here you'll then cycle back to Peschiera, crossing the stunning lake landscape. Day 7: Peschiera del Garda. After breakfast, end of tour. Return home or stay on for extra nights in Peschiera or perhaps Venice. Please ask for details of extra nights options. Routes are flat, and are on a mixture of cycling paths and minor roads (100% asphalt). Easy cycling in mostly flat areas, with only few short climbs and descents. Little effort required, suitable for most people. Day 2: Peschiera round tour (40 km, vertical up 180 m) Today’s cycle tour is a loop that will lead you to discover lovely rural villages rich in history and oeno-gastronomic tradition. This itinerary has a few slopes uphill – it is a hilly territory – and follows quiet roads. You only have to pay attention to the traffic before your arrival in Pozzolengo. The return to Peschiera will be on a cycle track parallel with the main road. Day 3: Peschiera - Borghetto - Parco Sigurtà - Peschiera (30 km, vertical up 20 m) Easy cycle tour along a well-known and popular Italian cycle track, part of the Eurovelo 7. It is a very easy stage, on flat terrain and all the way on an asphalted cycle track. Day 5: Peschiera - Zoo Parco Natura Viva - Peschiera (30 km, vertical up 90 m) Easy and pleasant round stage. There are some stretches of dirt road along the lake and in the first part of the stage there are also some short slopes up and downhill. 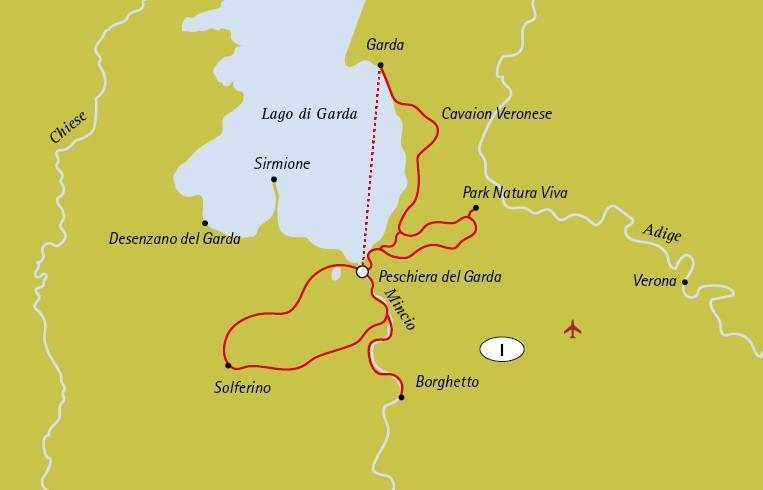 Day 6: Garda round tour (ferry + 25 km, vertical up 200 m) Today you’ll cycle among hills and hamlets sorrounding the lake, thanks to a short ferry transfer to Garda, the small town which gave the name to the lake. Once in Garda, you’ll start cycling towards Bardolino, famous for the red wine, and from there you’ll go back to Peschiera, crossing the sweet lake landscape. The Lake Garda for Families cycling holiday includes the daily transfer of luggage to the next hotel and local support if required. This cycling holiday uses city-bikes made with an aluminium frame and kitted out with responsive brakes and up to 27 Shimano gears. Plus: mudguards, trip computers, comfort gel saddles, flat-palmed grips, Schwalbe Marathon anti-puncture tyres as standard. They are available as either male or unisex frames. This cycling holiday stays in a good quality 3 * hotel with private facilities. We have personally chosen this hotel mindful of your comfort as well as the proximity to cycling paths and any relevant local sites. All rooms have en suite facilities and are equipped with air conditioning. If you wish to know specific information about the hotel facilities, Wi-Fi and upgrades used on the holidays, please contact us on +44 (0) 800 7555385 for more information. You will receive your final tour details approximately 4 weeks prior to your arrival date detailing the hotels used on your cycling holiday. If you wish to know more about the hotels prior to completing a booking form, please contact our Customer Services team via email or by phone.